New High-Definition Lens Technology | Richard C. Annis, O.D. Hi-Def (Digital) lenses have never before been possible. In fact, until just lately, the manufacturing of eyewear lenses has remained pretty much the way it was for decades. Sure, the machines have been improved and modernized, but the basic way they go about their work has remained unchanged. Until now! The newest Hi-Def lens technology has now made it possible to customize lenses for you and your prescription, taking into account how to best maximize your vision in whatever direction your eye happens to look . Traditionally, vision has always been sharpest straight ahead but becomes a little "off" in all the other directions. These distortions have always made for lesser quality vision in every direction other than precisely straight ahead. By a digital process, we can now let a computer design the various features of a lens so that your vision is sharpened even in directions away from the lens centers! This greatly reduces most of the distortions we've always found present in lenses, especially out in the peripheries. New computer-generated Hi-Def technology can now take into account the angle of the eyes behind the lenses and adjust the lens power at each point to remain correct, even when viewing at angles through the periphery of the lenses. That means that whatever point in the lenses your eyes point through, the power there matches what your eye needs to see its best. 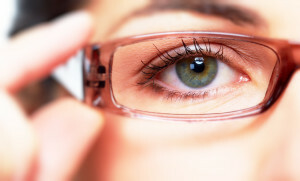 For those in progressive "no-line" lenses, it means that the placement and sizing of the reading area is created digitally for sharpest and most precise viewing. Result? Clearer, sharper vision through all parts of the lenses! And a sense that you're seeing much more normally and naturally. These cutting-edge lenses automatically come with non-glare, with super-strong scratch protection, and with UV block, so your eyes are protected and have much better vision without paying for a lot of extras. On top of that, they are backed with a strong manufacturer's warranty, so if there is anything at all you find objectionable, you're not stuck being dissatisfied. That's how strongly the manufacturer feels about your likelihood of falling in love with your new lenses! And we know you'll see the difference too! Come in or give us a call, and we'll be only too glad to share more information with you about this exciting new technology which is going to revolutionize the way we all see!